Like most evenings, Tom Krupp is looking forward to getting home to his wife, despite feeling guilty about what he’s been up to. Dinner should be almost ready. Driving along their street, Tom thinks about how much he loves Karen. Married only two years, the couple has been blissfully happy. As he parks the car in the driveway, he is greeted by the warm glow of their beautiful home. But once he reaches the front door, things go terribly wrong. First, the house is unlocked. Inside, he finds Karen’s purse and cell phone, but she’s nowhere around. All the lights are on, and it looks as though dinner prep was interrupted in the midst of chopping. A short time later, when the police show up, Tom’s world really starts to fall apart. The cops quickly assure him that his wife is alive. She’s been in an accident, a pretty bad one, but she will survive. What’s strange, though, is that she doesn’t remember what she was doing in the worst part of town or why she was speeding and running traffic signals. "...a first-class thriller with perfect pacing.... Not much is as it appears here, which is just the way lovers of suspense want it." While Karen may not have a clue, the police think they do. What’s worse, they suspect she knows, too, because her reckless driving wasn’t the only criminal act in the area that night. As the police ramp up their investigation, Karen begins recovering snatches of her memory, but the most crucial parts remain elusive. Can anyone help her? The Krupps’ neighbor, Brigid, certainly wants to try. Brigid lives right across the street, and Karen considers her a good friend, but for some reason Tom doesn’t want anything to do with her. His attitude is making Karen’s situation beyond difficult. Now more than ever, she needs a good friend, especially with the cops nosing around. What do they suspect she’s done anyway? Anxious to leave the hospital, Karen longs to get back home. Once there, maybe the pieces of the puzzle will finally come together. Before the accident, she recalls, she’d begun noticing things out of place on occasion. Subtle differences, but she believes someone had been in their home while they were out. Could that be related somehow to the night of the accident? She prays her memory will return soon, for besides the intense scrutiny the police have put her under, the cloud of uncertainty has strained the Krupps’ marriage. A few short days ago, they were living their dream. Now secrets from their pasts have them viewing each other with distrust. How could this happen so fast? More importantly, what exactly happened? The mere concept of waking up in a hospital with no memory of how you got there is enough to scare a person witless. Add in the police telling you that you were driving like a maniac --- something you would never do --- and ran your car into a pole. Well, regaining your memory would seem like the most important thing right about then. Or would it? Maybe you don’t want to know after all. 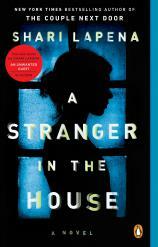 A STRANGER IN THE HOUSE is a first-class thriller with perfect pacing. Tom and Karen Krupp come across as exactly the type of neighbors anyone would want living across the street, which makes readers think how lucky Brigid is to have them. But then the truth slowly bleeds out, sowing suspicion and shattering some pretty solid beliefs about the characters. Who is the good guy in this story? And who is the stranger in the house? Not much is as it appears here, which is just the way lovers of suspense want it.